I pre-ordered The Networked Nonprofit and cracked it open the day I received it last summer. 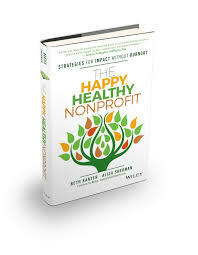 Authors Beth Kanter and Allison Fine are gurus of nonprofit social media and the implications for organizations, and I was eager to continue to learn from them. What I didn’t realize is that the book would provide both conceptual and tactical frameworks for advancing any organization’s work, regardless of where you are starting from. While I’ve recommended the book to many, here at Darim we were eager to really engage with others about what this means for Jewish organizations, their leaders, and the community as a whole. On Monday, we’re launching Darim’s Networked Nonprofit Book Club. Based in the new Facebook Groups, we’ll be posing discussion questions from one or two chapters each week. We hope to learn what you’re thinking, doing, learning, and struggling with. And we hope to learn from each other, help each other solve problems, and also get a sense of where Darim’s efforts could make an important difference for you and others. We’re also learning, as this is our first book club adventure and our first large scale experiment with the updated version of Facebook Groups. So far, 137 people have joined — which has far exceeded our expectations! Even authors Beth Kanter and Allison Fine are on board. We hope the opportunity will help participants learn the “ins and outs” of this new tool along with us, and consider how it can be useful in their communities too. We welcome your input, suggestions and reflections on it — leave a comment here, in the group, or email us at learningnetwork@darimonline.org to share your thoughts. Want to join us? No cost – just swing on by: http://on.fb.me/netnonbookclub We have posted some initial info and guidelines for the Book Club. In the interest of sharing and encouraging others to experiment with Groups, book clubs, and online community facilitation, we’re posting the information here (see below) and will be sharing updates in future blog posts. Everything on this blog will be tagged "bookclub" and "#netnon". Tweeting? Use #darim and #netnon (which is the hashtag for the book in general). Hope to see you there! It kicks off Monday, though you’re welcome to swing by and join the conversation anytime. How We’ll Work Together We will focus on one or two chapters each week beginning January 10. Each week, Darim staff will kick off the conversation with one or two questions per week that relates to themes in that chapter and implications for Jewish organizations. Together, we will reflect on what that means for our work as Jewish professionals and lay leaders. Respond to our discussion questions by commenting on that post. You can also pose questions to the group, or share links or other information by posting your own status updates to the group. We encourage you to participate in ways that are most meaningful to you. Feel free to jump into – and even initiate – conversations, and to post relevant links and resources to share with the group. If you prefer to dip in and out of the discussions, that’s cool too! There are no preconceived expectations — we want you to learn, experiment, share and connect with others. Tips for Using Facebook Groups Notification settings: BY DEFAULT, You will receive any status that is posted to the group. If you comment on it, you will also receive notifications of any additional comments on that posting. If you’d prefer NOT to receive these notifications, you can click “unsubscribe” next to that specific posting. If you’d like to receive notification about a posting that you haven’t commented on, you can click “subscribe” next to it. To change your default settings, please visit “edit settings” in the top right corner of the group. Adding members: You probably noticed that you can add your Facebook friends to the group if they are on Facebook. Please feel free to add anyone who would like to join – we only ask that you check with them first to see if they are interested. You will find the “Add Friends to Group” link under the Members photos on the right hand column. You can also email them the link to our Group so they can opt in if they’d like. http://on.fb.me/netnonbookclub Group Chat: You can chat with group members who are online in real time by clicking on the “Chat with Group” link under the Members photos on the right hand column or by clicking the tab at bottom of the page. This is a fun way to make a personal connection with others in the group. When the chat box opens, you’ll see photos of group members — those with a green box are currently online. You can elect to have group chat messages sent to you going to “edit settings” and selecting that option. Living Room Policy: While we have very few rules, we do want to make the Book Club experience as fun, useful and efficient as possible for everyone. Thus, we ask you to abide by the Living Room Policy, which is basically this: If I were to invite you into my living room, I would expect you to be courteous and sociable. You are welcome to disagree or challenge me or anyone else, but you must do so respectfully. Also, vibrant discussions require good listening and asking questions or others, not only talking about yourself. Finally, please refrain from using this as a platform for marketing unrelated products or programs. And if you have any questions, please feel free to ask us at learningnetwork@darimonline.org. It may take a little time for you to determine your personal preferences and customize them to fit your needs. Don’t be afraid to take them out for a test ride, tweak as needed, and/or ask us if you need help. Interested in more technical details? You can learn more about Facebook Groups here: http://bit.ly/fvSAor Resources for the Book Club If you have not already done so, please be sure to order your copy of The Networked NonProfit by Beth Kanter and Allison Fine. Here is a link to Amazon: http://bit.ly/aOa6nX And please feel free to view the recording of the recent Darim webinar with Allison Fine and Lisa Colton in which they discussed networked nonprofits and Jewish organizations: http://bit.ly/c8Iudm Are you tweeting? #netnon is the hashtag for the book, and #darim is for our community. Want to learn even more?! Join us at NTC in DC! Join us at NTEN’s annual Nonprofit Technology Conference (NTC). And by “us” we mean a whole bunch of Jewish leaders like you – in addition to the fabulous NTC program (where top notch thinkers like authors Beth Kanter and Allison Fine regularly speak), the Schusterman Family Foundation and Darim Online are hosting a series of events for our members. Click here to learn more about it: http://bit.ly/igDAzB – we hope to see you there! Need A Hanukkah Gift For Your Boss? Posted on November 23, 2010 by Author Lisa Colton Leave a comment on Need A Hanukkah Gift For Your Boss? Y ou’re looking for the gift that keeps on giving, right? I’ve got just the thing for you. Pick up a copy of Beth Kanter and Allison Fine’s book The Networked Nonprofit. A fun read with great stories and case studies, this book will help any nonprofit leader better understand the impact and opportunities of working in a networked world. THEN SIGN UP FOR OUR ONLINE BOOK GROUP! That’s right. Starting in January, we’ll be hosting a free online book group to discuss the concepts and their application to our work in the Jewish community. Bonus: experience the joys of the new Facebook Groups feature while you’re at it. You can join the book group now, and we’ll kick off discussion in January. That gives you just enough time to get copies for your co-workers, plus one for yourself, and read it in mid-December while everyone else is still scrambling for that other holiday, or by a cozy fire, or on the beach in Hawaii or where ever you might take a winter vacation… Have you read the book yet? What are you interested in discussing? What ideas grabbed your attention? New Darim Book Group: The Networked Nonprofit – Join Us! Posted on November 9, 2010 by Author Lisa Colton Leave a comment on New Darim Book Group: The Networked Nonprofit – Join Us! As part of our 10th Birthday Celebration, Darim is thrilled to announce our new book club! Following on the success of our recent webinar with Allison Fine, we are starting a book group to dive more deeply into The Networked Nonprofit and what it means for transforming Jewish organizations. Darim is excited to launch our very first book club to deepen our understanding of "networked nonprofits," and to help each other adopt these approaches into our work. Starting January 10th we’ll be discussing a chapter of The Networked Nonprofit each week. In January we’ll start posting questions to guide our discussion. Share your thoughts and questions as we learn from each other! Please note: there is no cost to participate, but you will need to login to Facebook to join the group. Join us – and get reading! You can buy The Networked Nonprofit by Allison Fine and Beth Kanter here.